“OK, who has the memorized?” Professor Dan Crozier asks the dozen students in his advanced acting class–all of them clutching copies of Romeo and Juliet as they shiver in the cool air of early spring outside the new Vukovich Center for Communication Arts. Crozier moved his class from the relative privacy of the center’s rehearsal room to its courtyard, a public stage where students can practice their craft. It’s the perfect venue for students to act out the play’s famous balcony scene–the aspiring Juliets climb the courtyard’s steps and fan out along the railing above, while the Romeos remain at ground level to declare their love. Up until now, the students have been reading–almost but not quite in unison–lines from their books. “It’s not the same experience, the same rhythm, when you’re constantly looking down to read,” Crozier tells his students. Two volunteers step forward to recite the lines from memory, with Crozier offering the occasional suggestion on how they can be more expressive. Romeo takes Crozier’s advice to heart, scaling the outside of the courtyard’s stairway to get that much closer to Juliet. Passers-by heading to the Campus Center become an impromptu audience, with most at least turning their heads to soak in a snippet of Shakespeare. Activity both inside and outside the Vukovich Center is, quite intentionally, always on display. The facility, which opened for classes this spring semester, has expansive windows and a central location in the College’s evolving “Gator Quad”–a well-traveled corridor bordered by creative spaces in Arnold Hall of Music, Doane Hall of Art, and the College’s art galleries. 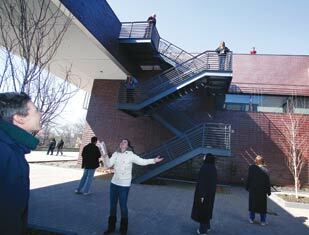 Home to the popular and innovative communication arts and theatre department, the Vukovich Center is foremost a teaching and learning facility, rather than simply a performance venue. It’s a place where technology and an aesthetically direct approach to architecture combine to complement the close interaction of faculty and students that is a hall-mark of the liberal arts experience at Allegheny. Most important, the Vukovich Center provides a state-of-the-art canvas on which students from across the disciplines can learn to express their ideas in innovative and meaningful ways. That cross-departmental ethos is especially fitting since the Vukovich Center is named in honor of Robert Vukovich ’65–a biology major at Allegheny–and his wife, Laura. The couple provided the lead gift to construct the center, which also received support from many other generous donors. Without the support of generous donors, the Vukovich Center for Communication Arts would not exist to provide meaningful opportunities for Allegheny students today and for generations to come. Donors and guests gathered on campus on April 17-18 to celebrate the dedication and grand opening of the Vukovich Center. The festivities included an encore performance of the Playshop Theatre’s production of You Can’t Take It With You–complete with cameo appearances by Gladys Mullenix Black ’54, in whose honor the new theatre is named, and Allegheny president emeritus Richard Cook. The weekend also featured the second annual ACTV Film Festival and a community open house with tours of the facility. In addition, former Allegheny trustee Marvin Suomi and his wife, Mariclare, have made a significant pledge to the Vukovich Center. And many alumni and friends of Allegheny helped to support the project with their financial contributions. The $23 million Vukovich Center spans 40,000 square feet near the campus’s northeastern edge, just south of the North Village residential complex and east of Caflisch Hall. Even with that impressive footprint, the building doesn’t overwhelm or seem out of place on Allegheny’s historic campus. The center was built into a hillside to increase its energy efficiency and minimize the perceived height of its fly tower–which houses the system of ropes, counterweights, and pulleys that allows the technical crew to quickly move lights, microphones, and scenery in the Gladys Mullenix Black Theatre. Thanks to those abundant windows as well as skylights, sunlight does penetrate far into the building. It’s especially evident in the first floor’s central spine, known as “The Street,” through which one must travel to reach many of the center’s rehearsal, instructional, and production spaces. All of that foot traffic creates a sense of vibrancy and community in the Vukovich Center, what Schliemann calls “productive collisions” among the building’s occupants and visitors. It’s not unusual to see students linger–talking, studying, working on their laptops–at the tables and chairs that dot open spaces and hallways on all three of the building’s floors, even at times when they don’t need to be there for class. But those common areas aren’t just for hanging out. Ishita Sinha Roy, an associate professor of communication arts who specializes in media, rhetorical, and cultural studies, has held several class discussions in the center’s lobby. She also has assigned students in her Media Criticism course to work as teams to build sculptures–“related to the class, believe it or not,” says Sinha Roy–from snow packed in front of the building. Crozier likewise sees exciting performance pos-sibilities for the facility’s rooftop garden, named “Laura’s Garden Terrace” in honor of Laura Vukovich. The garden–which includes perennial grasses, bulbs, shrubs, trees, and lawn space–has environmental benefits, insulating the building and absorbing rainwater that would run off a traditional roof. It’s also a space that welcomes visitors, with cedar-plank pathways and benches throughout. Crozier says the garden, along with the courtyard, is reminiscent of the outdoor settings in which Shakespeare’s plays were originally performed. “I don’t think students realize yet how exhilarating it’s going to be to perform in these spaces,” he adds. Using the Vukovich Center’s nontraditional learning spaces stimulates discussion in multiple ways, explains Sinha Roy. And it encourages students to see themselves as creative and their environment and culture not as preformed but as something they can shape. Amy Vietmeier ’09, a communication arts major and psychology minor, sees the Vukovich Center as an ideal learning environment, thanks to its advanced presentation equipment and spaces that transcend the conventional classroom. “The facility will definitely help prepare me for my career,” says Vietmeier, who took five classes in the center this spring. The Vukovich Center’s second floor features technology-enhanced classrooms used for a variety of communication arts courses, while the third floor houses offices for communication arts and theatre department faculty. But it’s the facility’s first floor that has generated the most enthusiasm. Technical director Scott Choffel ’72 (second from right) works with students on the grid above the Black Theatre’s stage. Branch points specifically to the first floor’s media screening room, which allows students to experience their work on a movie-theater-style screen and in surround sound. That means students can now conceive of sound and motion–versus sound as static and coming from one source–as part of the creative process. The department’s visual production courses have found a new home in the Lee & Sue O’Connor Idleman Production Wing. The wing features a large television studio with three high-definition cameras, professional lighting, and an adjoining control room. In addition, there’s an editing lab with ten Mac Pro computers, a smaller post-production room for introductory courses, space for community-based media projects, and offices for ACTV, the student-run television station. “Everything that was crammed into two small rooms in Arter Hall is now spread out,” says communication arts professor Mike Keeley. 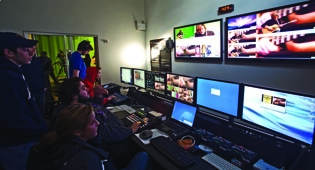 The additional space gives students and faculty the opportunity to try things they couldn’t before, such as having multiple sets in the television studio. That was impossible in Arter because large items couldn’t be moved through the studio door. There’s particular excitement surrounding the rehearsal room in the Idleman Production Wing. It has the same flooring material as the theatre’s stage, providing students with an authentic rehearsal experience when the large space is unavailable. Its location in the production wing encourages stu-dents and faculty from different fields in the department to interact and collaborate in distinctive ways. Next year, Crozier and Keeley will teach an Acting for the Camera course that brings together elements of visual production and the theatre. It’s something they had long planned to do–and now can thanks to the flexibility offered by the Vukovich Center. 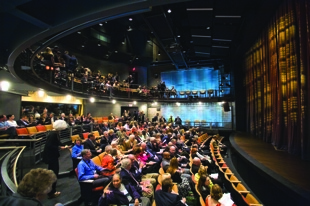 The center’s rehearsal and instructional spaces play key supporting roles to the building’s star, the 250-seat Gladys Mullenix Black Theatre. Stunning yet unpretentious, it’s a place where instruction and performance meld in exciting ways. “Even though the Playshop Theatre [in Arter Hall] was really fabulous, it posed a lot of limitations in what we were able to do in the theatre itself and in the support facilities and classrooms,” says Michael Mehler, an assistant professor of theatre who specializes in scenery and lighting design. “The people here have always had the capacity to work in a much greater realization of production and the new theatre allows us to do that.”The horseshoe shape of the theatre’s seating creates a closeness and synergy between audience and actor. The theatre also includes a balcony–which Schliemann notes is relatively uncommon in smaller venues–to bring spectators that much closer to the stage. 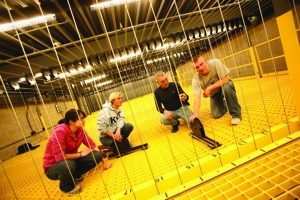 And the technical aspects of the theatre–including the catwalk, lighting grids, and pipe grids–are exposed, providing a unique behind-the-scenes perspective to teachers, learners, and theatergoers alike. In addition, the theatre has easy access to the Vukovich Center’s spacious scene and costume shops, allowing sets and props to be designed and moved efficiently. That’s a striking transformation from the old scene shop. Detached from Arter Hall, it required sets to be constructed in pieces, transported through the often uncooperative elements of late fall and early winter, and then assembled in the Playshop Theatre. The Vukovich Center also features a green room that can be used by performers and speakers before shows and other times they’re not on stage. 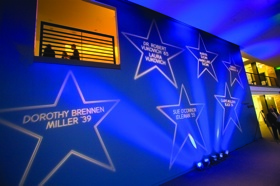 Named in honor of Barbara Webb Robinson ’54, the green room even includes showers–a requirement should a unionized professional actor perform at the facility. The theatre officially opened with a production of the Moss Hart and George S. Kaufman comedy You Can’t Take It With You, directed by Crozier. After four performances in early April, the cast presented the play again in the middle of that month for the dedication and grand opening of the Vukovich Center. That weekend, the theatre also showcased both student and alumni works at the second annual ACTV Film Festival–testifying to the versatility of the Vukovich Center in accommodating a wide variety of public events. Just as the Vukovich Center has deepened collaboration within the communication arts and theatre department, faculty there are hopeful that the facility will foster partnerships across campus and the community. Natural connections exist at Allegheny among students and faculty in art, music, theatre, and film, says Keeley. And he sees those ties becoming even stronger now that those departments are in close physical proximity. There’s also tremendous interest in using the Vukovich Center to reach out into the local community, the region, and beyond.She offers the hypothetical example of teaching a course on advertising, working with the department of environmental science to promote and market green programs on campus. “Suddenly, there’s a magic there with students seeing how these things come together–and how they’re not discipline-bound,” Sinha Roy explains. Crozier sees possibilities for workshops and festivals for high school students and teachers that draw from the expertise of communication arts and theatre faculty as well as those from the music and art departments; Sinha Roy hopes to invite community partners to lead and attend special events as part of next year’s “Year of Social Change” programming; and Keeley anticipates increased opportunities–like the ACTV film festival–for students to share their works with a wider audience. Even as those channels for collaboration and outreach expand and evolve, the core mission of activity in the Vukovich Center will remain the same–to prepare students to formulate ideas and communicate them in persuasive and engaging ways. This article appeared in the Winter/Spring 2009 issue of Allegheny Magazine.